Brooklyn artisan chocolatiers, the Mast brothers want to connect chocolate lovers to their favorite food… And start a chocolate revolution. The dark chocolate bars are handmade in small batches by the brothers personally in their Williamsburg factory, using the world’s best cacao sourced from small family farms and coops around the world. Each Mast Brothers chocolate bar is made from organic coco beans. In addition, the brothers work with sustainable global coops so that they are the most natural, unadulterated cocoa beans on the market, and handcraft every bar locally themselves from start to completion rather than take advantage of cheap labor in under-developed countries like Madagascar. As if that wasn’t fabulous enough, some spectacular limited edition chocolate bar wrappers were designed in collaboration with local artists. Stop by the Mast Brothers factory at 105A North 3rd Street in Brooklyn, NY to experience the true chocolate making process. 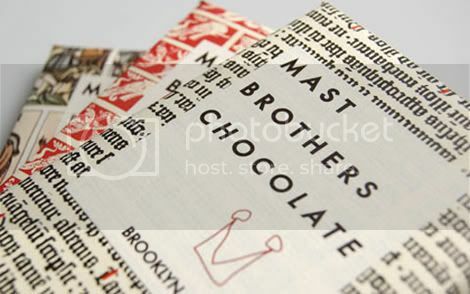 Mast Brothers chocolate bars are available for purchase online at murrayscheese.com and provisionsshop.com.